The NEW Silhouette multi-fold towel dispenser provides a sleek yet elegant design suitable for multifold and folded towel configurations. The Silhouette® Multi-Fold Towel dispenser is a simple slim designed dispenser, suitable to fit in the smallest spaces. 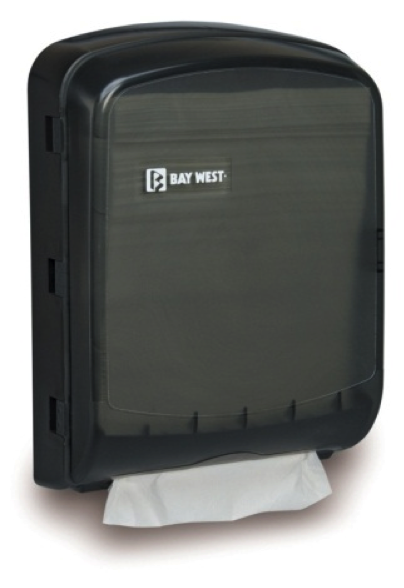 The Silhouette® Multi-Fold Towel dispenser features easy-opening doors for accessibility and maintenance. The Multi-fold dispensers is ideal for applications seeking high-quality reliable towelling including government facilities, restaurants and lodging. The durable constructed dispenser has a translucent exterior, allowing the customer to see if the dispenser needs refilling. The Multi-Fold Hand Towel dispenser is only available in Black.